Obtaining the minimum size of the joint in the tile laying process is possible due to the use of tiles subjected to the rectification process. This does not mean, however, that you can use a completely jointless assembly method. Rectification is a mechanical process of milling the edge of the tile at right angles. The resulting elements can be laid with no fear of size differences because in the rectification process, each tile obtains the same dimension with an accuracy of 0.2 mm. Both wall and floor tiles are subject to rectification, but in the case of the latter, however, it is particularly important – owing to the rectification of the tiles, the ones intended for mounting on the floors do not have to be grouped on calibres. 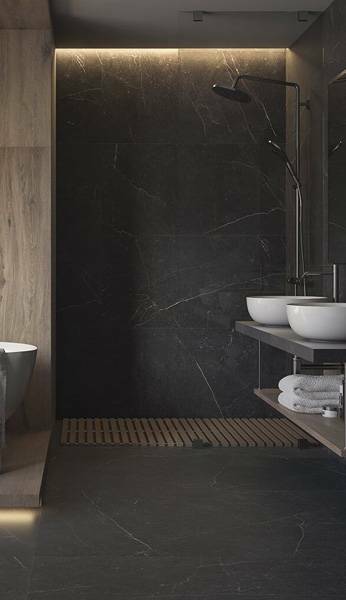 The appearance of rectified tiles on the market has caused them to be named jointless – in other words those for assembly which are not required to use any grouts. As the main argument, perfectly equal edges of tiles were given, which when combined with each other give the effect of a uniform ceramic cladding on the whole surface. Unfortunately, this conviction – despite the clear declarations of manufacturers of ceramic claddings – still lingers as right among retail clients, sellers, designers, and some contractors. 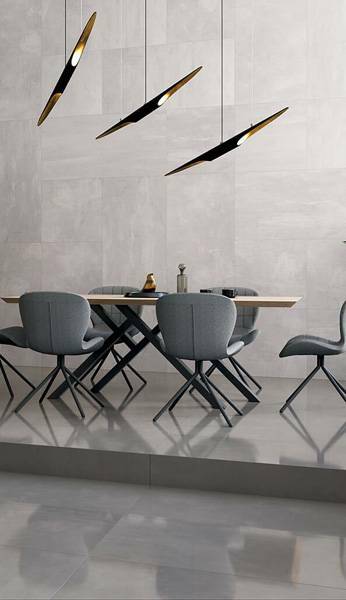 In fact, such method of assembly of ceramic tiles carries a huge risk of damaging them, mainly due to the linear expansion of the materials, and more specifically – to the differences between the values of this parameter for the substrate, glue, and ceramic elements mounted on them. To put it simply – each of the layers behaves differently under the influence of external factors and the use of expansion joints and grouts allows to overcome the resulting stresses. Jointless assembly creates a huge risk of damage to already laid tiles and can be treated as a mistake in the construction art. The tiles manufactured in the production plants of Ceramika Paradyż do not require additional protection of the surface with impregnates. As a manufacturer of ceramic claddings, we do not recommend any agents for impregnating the tiles because they change the technical parameters of the cladding. The impregnate creates an additional layer on the surface of the tiles, thus giving other utility parameters and finally responding for their final appearance. In addition to changing the surface properties of the tile, there is also the risk of tarnishing, thus obtaining a visual opposite to the intended effect. Moreover, the impregnating layer is more prone to abrasion than the original surface of the tile, therefore the impregnation treatment should be repeated cyclically. Apparently, this effect can be seen after applying impregnation on tiles located in passageways, where impregnation over the years or even months undergoes mechanical abrasion in the most intensively used places. Properly used and maintained surface of floor tiles of Ceramika Paradyż does not require protection with additional chemical agents. So the matter of impregnation remains to the client’s decision, who, aware of all possible consequences related to it, decides to make an attempt to improve the quality of the tile. Glass decorations are a perfect complementation to the collection of ceramic tiles – their transparent character and saturation with vivid colours in an interesting and noticeable way can enrich any interior. Observing current market trends, glass is more and more often chosen by customers, both for large investments and for finishing small, home bathrooms. It should be remembered, however, that glass elements are a material more delicate than ceramics, therefore, during assembly and use, be careful when installing and using them. Initially, the glass decorations produced by Ceramika Paradyż were to be assembled using glue for mirrors. In April 2013, the method of production was changed, consisting of the application on the assembly side of mosaics, strips, panels or inserts of a special insulating layer, protecting against harmful printing, discolouring the effect of the adhesive. Elements manufactured after this date can be mounted on ceramic tile adhesive – which is certainly a great help in the work of every tiler. It should be remembered, however, that it is absolutely necessary to follow the instructions for using the product contained by a given construction chemicals manufacturer on the packaging, which will prevent the wrong use of the adhesive and, as a result, damage to the decorations after they have been installed. Designing a small bathroom is a challenge for any designer. In the first phase there are always questions about not only the equipment, but most of all the style of the room. 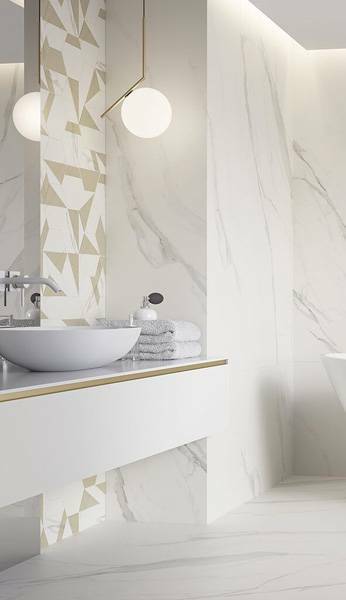 The richness of design, formats, and colours offered by the manufacturers of tiles and fittings gives a dizzying sense – manufacturers are flooding the market with new ideas referring to nautical, oriental, traditional or minimalist styles. So if you are waiting for a renovation, ask yourself a question: who will the bathroom be designed for, what style do you feel best in? Currently, the leading styles are modern and minimalism. Patterns of tiles often imitate natural stone, including marbles or sandstone. 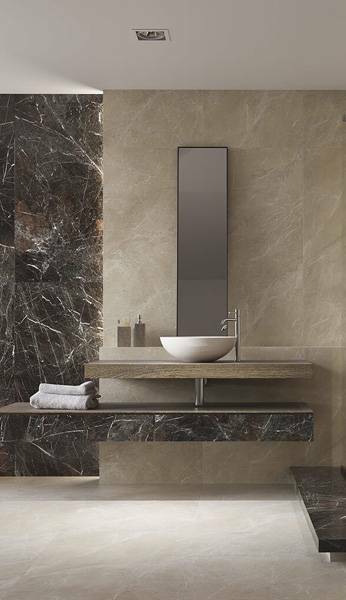 Such a simple form, a contrasting combination of colours, raw materials (glass or metal) are almost made for small bathrooms – large formats of rectified tiles form uniform surfaces on the walls, while subtle and subdued design does not divide such a small area. These formats are often found in a semi-polished surface, which means that you can optically get more space in a small bathroom. The colourful glass decorative strips which break the colour monotony and warm up the interior become an original solution. In addition, decorative elements in large-format collections are mosaics which also allow to create complex artistic elements and perfectly combine with large formats of tiles or other forms of wall decorations.